Conquer Divide release new single "What's left Inside" on Artery Recordings, premiering the new music video on Revolver Magazine here. Based in the United States and England, Conquer Divide (For Fans of Asking Alexandra, Flyleaf, Pvris) have made a name for themselves with their catchy hooks, and their ability to quickly embarrass guys who don't think girls can play. 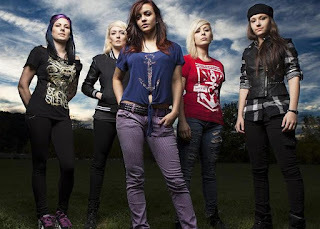 The six-member all female band (consisting of Kiarely Castillo, Janel Duarte, Kristen Woutersz, Isabel “Izzy” Johnson, Tamara Tadic and Ashley Colby) has managed to capture the attention and gain the respect from their ever growing fan base and critics alike. Over the past three years, the band have toured with Alesana, Slaves, Iwrestledabearonce, Upon A Burning Body with multiple featured showcases at SXSW. In their recently released self-titled album, Conquer Divide was pushed to their limits and thought outside the box as they worked with gold record producer/engineer Joey Sturgis (Asking Alexandria, Blessthefall, Of Mice & Men). As a result of a stellar album and allot of hardwork, Their debut album “Conquer Divide” ranked #13 on Billboard’s HeatSeeker charts. To date, the band have released videos for “At War” and “Nightmare” acquiring a million plus views, along side single "Sink Your Teeth Into This" featuring Denis Stoff of Asking Alexandria which garnished praise from critics and skeptics alike. Conquer Divide is set to hit the air waves with a very personal single “What’s Left Inside.” Kristen describe the song to be “cathartic,” and hopes to motivate fans to turn a negative situation into something positive. Conquer Divide is excited to release their new single/music video and ready to prove they can hang with the best of them. 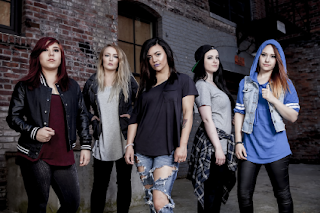 Be sure to keep your eye on Conquer Divide as they are primed and ready to take the music industry by storm. And, keep your eyes here, as my review of this album will be up soon!